Contributions come from churches, businesses and interested families and individuals. Our board of directors approved a budget/financial plan for 2019 that totals $475,000. 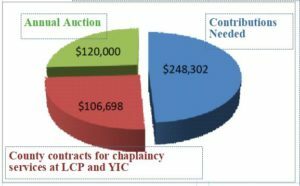 As you can see in the chart below, approximately $250,000 is needed annually from contributions. 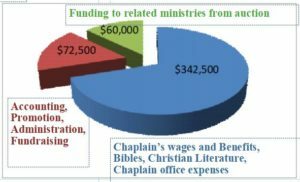 About 16% of income is used for management and promotion, leaving the remaining 84% to go directly to chaplains, Bibles, in prison and/or aftercare ministries. Support for Prison Ministries would like to take this opportunity to thank all contributors for the gifts to support what GOD is doing in prisons today. Donors can maximize their tax deductible giving. In addition to cash contributions, Support for Prison Ministries can receive gifts from foundations, wills, trusts, donations of stocks or real estate, life income plans and bequests. Professional counsel is available through SFPM staff and Everence Financial Advisors. To assist the local church in the ministry of reconciliation to men and women involved with the criminal justice system. info@SupportForPrisonMinistries.org Follow us on Facebook!